KIEV, Ukraine -- Pro-Russian separatists carried out 26 attacks across eastern Ukraine including strikes on embattled Donetsk Airport, the Ukrainian military said. Sergei Lavrov, Russia's foreign minister, called President Petro Poroshenko the “best chance Ukraine has at the moment” and said Russia has established “business-like relations” with him. Rebels used artillery, mortars, grenade launchers and small arms in the assaults carried out over the past 24 hours, the military said on Facebook today, adding that it continues to unilaterally observe a truce. “By bringing in reinforcements, we thought Russia was trying to put a leash on the separatists and consolidate control over them,” Joerg Forbrig, senior program director at the German Marshall Fund of the U.S. in Berlin, said by phone. Locked in its worst standoff since the Cold War with the U.S. and the European Union over Ukraine’s future, Russia’s economy is threatened by a collapsing ruble and falling oil prices. U.S. lawmakers are pushing for even tighter sanctions to squeeze President Vladimir Putin’s administration. The EU and the U.S. have imposed sanctions on Russian individuals, companies as well as on finance, energy and defense industries. The ruble was trading 0.6 percent weaker at 68.3200 a dollar as of 12:32 p.m. in Moscow. The Micex index of Russian shares was down 1.9 percent. Oil in New York was down 1.4 percent at $55.17 a barrel. Ukraine needs $15 billion in additional financial aid, European Commission President Jean-Claude Juncker told the European Parliament today in Strasbourg, France. U.S. Vice President Joe Biden pledged to help Ukraine, which is seeking to stave off a default as its economy shrinks under the strain of the conflict and spending cuts. Foreign reserves are languishing at the lowest in more than a decade and the government is grappling with the deepest recession since 2009, with a $17 billion international bailout proving insufficient. As well as with the U.S. and EU, Ukraine is in talks with the International Monetary Fund over financial assistance, Ukrainian President Petro Poroshenko said yesterday in Kiev. The previous day, his deputy chief of staff, Valeriy Chaly, put the figure required at $10 billion or more. Ukraine is seeking to unlock the next tranche of an IMF-led rescue and plans to approve a 2015 budget prepared by the country’s new government on Dec. 26. An IMF mission will return to the former Soviet republic early next year, First Deputy Managing Director David Lipton said Dec. 13 in an e-mailed statement. Russian Foreign Minister Sergei Lavrov said he sees reason for some optimism in resolving the Ukraine crisis, where the latest cease-fire is stemming fatalities. Striking a more conciliatory tone than in recent months, Lavrov backed Ukraine’s territorial integrity and rejected the notion of a “second Crimea,” which Russia annexed from its neighbor in March, in the eastern Donetsk and Luhansk regions. 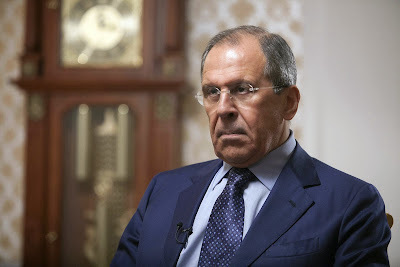 Speaking in an interview with France 24 television, Lavrov said his government is pressing for peace talks to continue in the Belarusian capital of Minsk between Ukraine and the pro-Russian insurgents its army has been battling for nine months. He called Poroshenko the “best chance Ukraine has at the moment” and said Russia has established “business-like relations” with him. “Ukraine as we recognize it now is territorially integral from the Russian point of view and should be supported in this form,” Lavrov said. While the truce in eastern Ukraine has curbed the bloodshed, with no deaths reported since Dec. 11, talks on a lasting peace deal have been delayed in a conflict that’s killed more than 4,700. Ukraine has said it backs negotiations in Minsk, which would also involve the Organization for Security and Cooperation in Europe. A “high risk” of military action remains, Ukrainian defense spokesman Vladyslav Seleznyov told reporters yesterday. Poroshenko told Biden in a phone call that signing a bill from Congress imposing new sanctions on Russia would “renew the assurance of solidarity of the American people with Ukraine,” according to a statement on the Ukrainian presidential website yesterday. President Barack Obama intends to sign the legislation, probably by the end of the week, White House spokesman Josh Earnest told reporters yesterday. The bill authorizes -- but doesn’t require -- the U.S. to place more sanctions on Russia’s energy industry and provide arms and other lethal aid to Ukraine’s government, he said. The administration has “some concerns” about language in the bill that “does not reflect the consultations that are ongoing,” according to Earnest.